Faisalabad is one of the biggest cities in Pakistan and the hub of the textile industry. It is widely acknowledged as the Manchester of Pakistan due to its large industrial role. The quality of the fabrics produced in this city has no parallel. In fact, the fabric is something of a specialty of Faisalabad. Many people from all over the country flock to this city for a spot of cloth shopping. We aim to provide you all of the best of Faisalabad at our store. 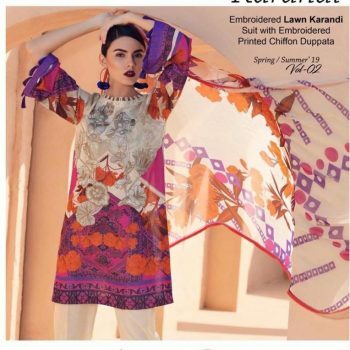 Faisalabad Fabric Store’s specialty is the traditional salwar kameez suiting, the chief of which is the lawn salwar kameez, which is also the most worn article of clothing in the entire country and is always in high demand. We deal in stitched as well as unstitched clothing. Our store hosts all major players of lawn manufacturing including Ittehad Textile, Gul Ahmed, Five Star Textile, Nishat Textile as well as all renowned designer clothing like Sana Safinaz, Asim Jofa, Al Karam, Maria B, Lakhani and many others. The main brand associated with Faisalabad Fabric Store is Moon Textile. Moon Textile Industries has been a major powerhouse of the textile industry for the past 30 years and has been churning out quality fabric for as long, releasing special collections for the masses every season. Our summer collection features stitched as well as unstitched articles of the fabrics lawn, cotton, and Arabic lawn. Our printed lawn features collection from Batik Lawn, Barkha Lawn, and Sohni Lawn. Embroidered collections as well as ready to wear collections are available. Our winter collection features the fabrics linen, cambric cotton, and khaddar. All of these are available in printed and embroidered articles. Our latest offering is for the home. We provide bedding of all kinds here at Faisalabad Fabric Store. The renowned bedding manufacturers like Nishat and Gohar Textile are available to us. All different articles of bedding are available like duvets, comforters, six-piece sets and three-piece sets. We deal in polyester, cotton satin, and denier fabric. No matter what you are looking for, if it is related to fabric then we are your best bet. Shop at Faisalabad Fabric Store for a unique shopping experience. Faisalabadfabricstore.com is a reliable source in stitched/unstitched men shalwar kameez suits. We deal in best fabric for the men like wash & wear, cotton, poly viscose, Linen, Karandi & khaddar suits both embroidered & Non embroidered form. Moreover, we also manufacture the men colorful kurtas as party wear in various fancy variety fabric like Jamawar, silk,& cotton sateen. We are Top retail sellers of gents shalwar kameez, kurta pajama and ship both in Pakistan also out of Pakistan & simultaneously deals in wholesale men salwar kameez/ salwar kameez suppliers and we deliver all over the world with top class stitching with very flexible MOQ for wholesale.